As discussed at the post An Effective and Comprehensive Climate Plan, feebates are the best way to combat climate change. Particularly effective are energy feebates, construction feebates and feebates in agriculture, land use and waste management. Image showing green lines of action that each need to be implemented, i.e. no line of action should not wait for another, nor should action on one line be used as an excuse to delay action on another line. Where lines of action are grouped together in three parts, numbers merely show relationships with the kinds of warming pictured at the top of the image. To facilitate the necessary shift to better products, fees are best imposed onto specific polluting products, where they are sold to the consumer, while each time using the revenues to fund rebates on better alternatives sold locally. Such policies are known as feebates, i.e. combinations of fees and rebates, each time tailored to address a specific type of pollution or threat. While feebates are the recommended policy instrument of the Climate Plan, each country can basically implement whatever policies they prefer, as long as agreed targets are reached. Similarly, feebates are best administered locally, but each country should decide to what extent they choose to delegate the authority to administer feebates locally. Feebates are recommended for their effectiveness. The recommendation to administer feebates locally can add to make the overall Climate Plan more acceptable to local communities. Since local communities will receive the revenues of fees collected in their area, they may choose to use the money to fund the programs they believe are best in their area. This offers a large amount of flexibility, provided - as said - that agreed targets are reached. Fees are best imposed on the sales of specific polluting products, e.g. fees can be added as a percentage on top of the price of fuel, where it is sold to the consumer, i.e. where the fuel is most likely to be burned. This will avoid that someone somewhere (e.g. in a remote country) claims to have added fees somewhere in the process of mining or manufacturing a polluting product, while it is hard if not impossible to verify whether the money - if indeed collected - is not handed straight back to the mining company or manufacturer in the form of subsidies, tax advantages or hidden benefits. Adding fees where the products are sold to the consumer will also avoid having to inspect products at the border and add import duties there. Fees are best added once all other cost elements, including sales taxes, have been added up and included in the price, so that the fees themselves are not taxed. In many places, sales taxes are already added to many products, so it is relatively easy to add the fees on top of such an existing collection mechanism. Where no such mechanisms are in place, it's good to implement them anyway, because it makes more sense to tax products than income. Feebates work best when implemented locally. As long as agreed targets are reached, the authority to decide what works best where can be delegated to local councils who can in turn delegate decisions to local communities. At the same time, a backup is required to ensure that all communities do reach agreed targets. Since sales taxes are commonly collected by state government, the revenues can best go into a Feebates Trust or Fund, which can return the revenues to the areas where the products were sold. In case a community fails to reach its targets (which should include emission reductions for each type of pollutant by an agreed annual percentage), the authority to administer the feebates should default back to state level. In that case, the Feebates Trust or Fund will allocate funding to state programs to combat climate change. Similarly, where a particular state fails to reach agreed targets, the authority to administer the feebates should default back to national government, which can impose federally-administered fees in that state and use the revenues for federal programs to combat climate change. Such a framework constitutes an incentive for state and local governments to make efforts to reach targets, as this will keep the revenues of feebates within local communities. Furthermore, the existence of a Feebates Trust or Fund adds an extra layer of accountability to ensure that all revenues of fees on sales specific polluting products are indeed used to fund rebates on the respective alternative sold locally. Which products should be eligible for rebates? That is a decision best made locally, as long as agreed targets to act comprehensively and effectively on climate change are reached. As said, included in such targets should be emission reductions for each type of pollutant by an agreed annual percentage, which means that shifts need to be facilitated towards better products. Some aspects of climate change are hard to tackle locally. This is particularly the case for the situation in the Arctic which does require specific action, but many countyries may feel that this is too remote from their geographic responsibility. 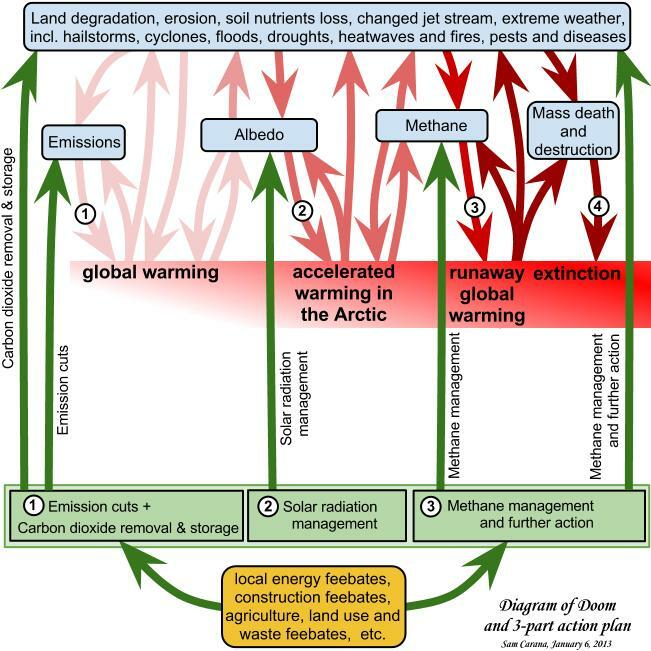 In this case, it makes sense to add fees, e.g., on international flights (in addition to fees that may already have been imposed locally, such as on jetfuel), and to use the reveneus to fund action such as the vessels proposed by Stephen Salter and John Latham, in order to provide much-needed cooling in the Arctic locally during the northern summer.